To those who truly understand what dancing is like and how much fun the experience can be, we thank you. To those who don’t have much experience taking an adult dance class but have an open mind about it, we also appreciate you. As for those who think dancing is no more than wearing a pretty pink tutu and moving back and forth in silly motions, we think that this blog post will prove to be quite educational for you. At Modern Ballroom Dance Studio, we’re very fortunate to do what we do because we truly love it. We don’t envy those who drag themselves to a job they dislike, and if anything, we encourage those people to give one of our adult dance classes a shot. Seriously — you’ll have a great time, you’ll meet new people, you’ll learn some new things, and you’ll even get a good workout in the process. Yes, that’s a win/win/win/win. 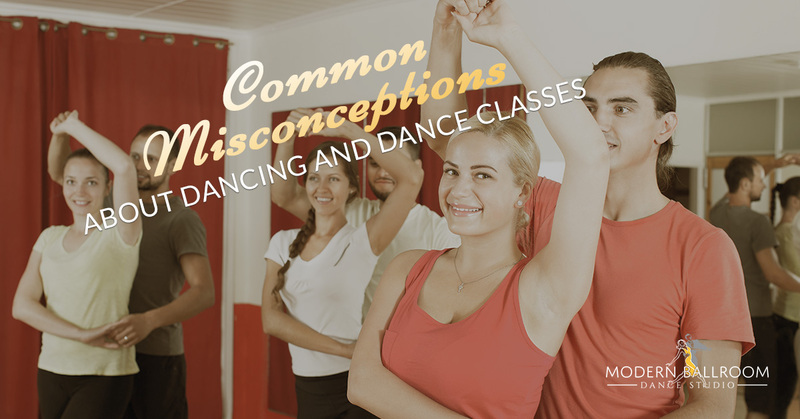 Read on as our dance instructors in Woodbridge address a few typical misconceptions about dances and dance classes. Hey, we’re just moving our bodies and feet around in a rhythmic fashion, right? How hard could that be? The answer: a lot harder than many people would think. As a career path, it’s one of the most challenging and competitive avenues out there. Like acting, dancing is a largely a cutthroat environment where top talent rules. When you factor in the potential for injury, extent of coordination involved, balance and poise required, and wear and tear that dancing can have on the body, it’s a lot more challenging than one might think. No. You don’t have to have any specific body type to come have fun at one of our adult dance classes here in Woodbridge, and you can also go pro with just about any body type. It’s not what’s on the outside that counts so much as it is the dancer within. So long as you can move your body, you’re already halfway there. Just because a man wants to express himself in a way that’s not necessarily “conventional” or “masculine” does not necessarily make him gay. Even if a male dance instructor is gay, is there a problem with that? We’d certainly hope not. People are more than allowed to express themselves as they see fit. Many male dance instructors are straight, and teaching ballet doesn’t define other aspects of their personality. Save the judgement for outside our ballroom dance studio! More often than not, this is merely a thinly veiled excuse just to bail on plans. If we’re abiding by the philosophy of tabula rasa, we can assume that no one was born as a dancer, engineer, professional baseball player, or world-famous cook. They became those things over time by practicing and developing their passions — passions that were also realized over time. Sure, you may not have a natural propensity for dancing, but if you’ve never tried it, then why knock it? Who knows what you’ll learn about yourself! If your goal is to make dancers absolutely livid, then by all means, tell them this (we’d recommend that, for your personal safety, you don’t — us dancers have big muscles, after all). Sure, perhaps dancing isn’t a “letter jacket sport”, but does that make the training, hard work, strength, determination, and commitment any less real? We don’t think so. No less than an NFL, NBA, or MLB team player, or even an Olympian, we’re also athletes. Whether or not we steal the international spotlight, this doesn’t change the amount of work that we put into our passions. At the end of the day, it’s up to you to decide what your thoughts are on dancers, dance classes, and dance culture in general. However, we’re confident that you’ll learn a lot and have a surprising amount of fun with us, especially if you’re dropping by for a social dance class. Check out our first-time dance class specials today, or contact us with any questions!